Back in the nineties, the internet was a “wild west” – a goldmine of opportunities where ordinary people could earn fortunes from gaming the search engines and pointing traffic to sales pages. It’s still a goldmine of opportunities. You just need to look in the right places. The Google search results may be dominated by big brands and less of a goldmine for most people. 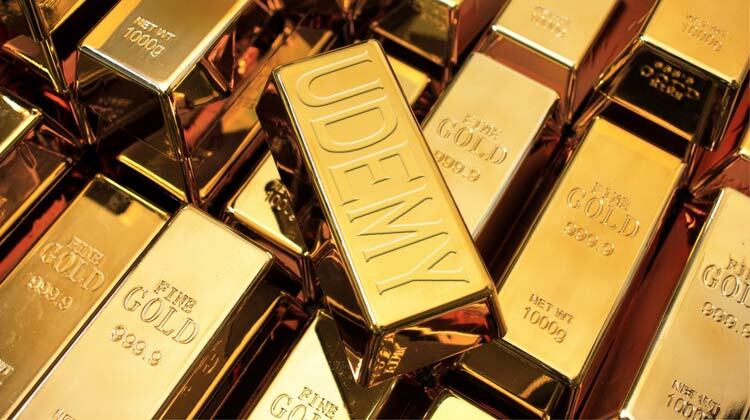 However, there are many smaller goldmines all over the web with low competion – and Udemy is one of them. Udemy is an online learning platform where anyone can upload video courses and teach the world. Head over to Udemy and start by creating your instructor page. Spend a bit of time on it. Upload a nice image. Connect all your social networks and your site. And, most importantly, write an engaging biography which explains how your courses can help people. Here’s my Udemy profile. What do you think? Make courses in areas you yourself have made money from or gained value with. Always be thinking of the value you can provide the student. Ask around. Ask your colleagues. What are you good at? What can you help people with? Try mind-mapping. You shouldn’t make just one course on Udemy, you should make several. So don’t make your first course a “complete” or “exhaustive” course. Split up your knowledge in to several specific areas. Further reading: The Subject Matter of Successful Udemy Video Courses. Start marketing even before you’ve started creating the product. Ask people (friends, colleagues, contacts, social media following, etc.) what they think of your course idea. Get as much feedback as you can about your potential course. You will learn a great deal about what to include in the course and you will drum up interest in and anticipation for the course when it comes out. The next thing to do is to click the Create A Course button on Udemy. Go on, click that button! Just enter “Test course” as your title because everything can be changed at a later date. There is a pop-up at this point to “tailor” your course and experience. Try to answer the questions about your course and audience as best you can but don’t worry about this. Next click on the Curriculum link on the left sidebar because this is where you’ll be spending most of your time. Fledgling Udemy instructors always totally over-think this part when it’s really very simple. You just have to map out your course lectures and start recording video. You can mind-map using pen and paper (I apologise for my scribbles above but you get the idea) or you could mind-map digitally (try MindMeister). 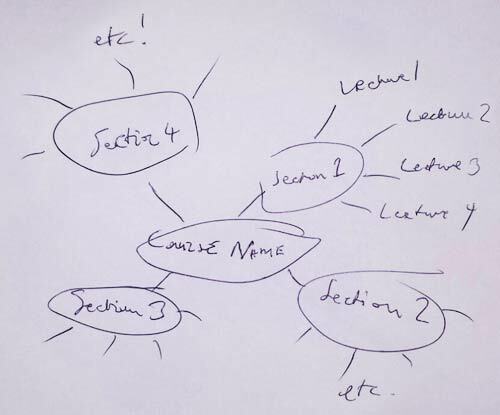 You could just write them out (you don’t have to mind-map) or you could plan you course out using the excellent curriculum editor in Udemy. The UX of the curriculum editor in Udemy is a joy to use. You can more-or-less plan and edit your course structure here. Remember, just because you publish a Lecture here in the editor, it doesn’t mean that it’s visible to anyone. This is just visually indicating that you have finished work on this Lecture. (You’re free to edit any Lecture at any time). Now, you don’t have to have the course structure 100% mapped out before you start recording the videos. You should start recording the video as soon as possible. Just go for it. Don’t over-think it. Put some slides together in Powerpoint or Keynote and record a video using Camtasia (PC) or Screenflow (Mac). Important: make sure the video is HD and in 16:9 format – so the slides should be 16:9 as well. Also, make sure the audio is as good as it can be as well. Spend around $100 on a decent quality microphone, buy something like a Blue Yeti or a Samson Meteor. As soon as you’ve got the first video done you should share it. There’s nothing worse than working on a video course in isolation. The quicker you get the first few videos done and receive feedback on them, the quicker you’ll get the whole course finished. Share them throughout social media and YouTube. And, especially, share one video on the Udemy Studio Facebook Group. Don’t just screencast a boring load of Powerpoint slides with a standard template and read out what’s written on the slides. Mix it up a bit. Record yourself talking to the camera. Do screencasts of software tutorials. Create awesome looking image only slides. Read from a script in some places; ad lib in other places. Upload useful supporting materials like PDFs, Word Docs or Excel spreadsheets that will have some tangible benefit to the student. Udemy courses can be divided into sections and you must use these sections. Students appreciate being introduced to a subject at the beginning of a section and then being quizzed on what they learned at the end. So, you should not only teach but demonstrate to the student what they have been taught. You don’t have to do much face to camera videos (and, god knows, I don’t like doing them) but you should do some. People will appreciate seeing who’s created the course they’re taking. Udemy has a huge community and eco-system around it. 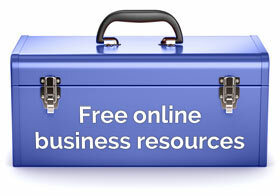 You should find it easy to meet likeminded course creators online that will be happy to help. I’ve already mentioned the Udemy Studio Facebook Group which is 30,000+ and can get a little narky (that’s British English, the American translation is gnarly). You could also try the smaller and altogether more erudite Online Video Educators & Entrepreneurs community at Google Plus. You can set up a Udemy course for success and earn passive income. You’ve just got to get started. Why? It’s inspiring! 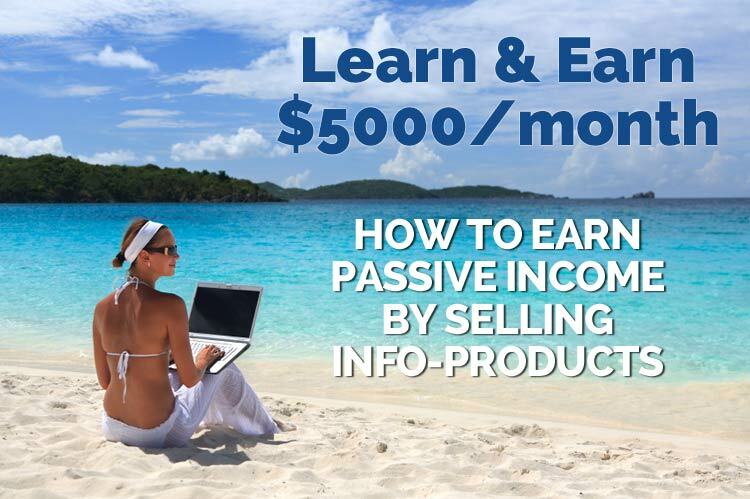 Learn more about selling courses on Udemy and how I make $5000+ a month doing this by clicking above image and taking my highly-rated bestselling course. It is a goldmine of useful information. As I am hopeless at the internet marketing side, I didn’t share my initial videos on social media. I have been all about complete the course perfectly. Even though it is now live I still haven’t shared it I have been tweaking, tweaking, tweaking. Don’t worry, Sharon. Your journey is the same as it was for the rest of us when we’re starting out on these platforms. It doesn’t mean you’ve done something wrong. It’s an on-going process of continual improvement. And I believe people tend to overthink things way too much because they are scared of what could happen next. I’ve seen this with people avoiding to do videos, extending the dates to release their very first blog, etc. As for your advice on Udemy here, I wished you had written about it before I decided to publish my huge training on WordPress. Now it is up there and it’s outdated so I don’t want to charge for it but it’s a really, really long training. PS. Btw, do you recommend I leave that big course there or to delete it? I’m not even sure if I can get rid of it but it already has 1,800 students so I think creating better content and cross promoting would be a better idea, what do you think? A lot of people make the “big, first course” mistake. I was lucky – I’m lazy so I didn’t! Yes, I’d keep that WordPress one free – or see if you could delete the out-of-date videos. If the videos are just using the old version of WordPress but still showing useful things then they’re completely legitimate to have on there. I understand that Udemy encourages people to test their courses first with a 2 minute video – maybe the intro clip – before full acceptance. Apparently, passing this test makes your whole course much more likely to be accepted, rather than the other option of uploading all in one go? Hi Marty, I don’t think so. I think it would be a really good idea to test your video at the Udemy Studio on Facebook and see if it gets “approval” there but that’s just a good idea. Your course will be approved if the video and audio is up to a certain standard and if you’ve met the various criteria – otherwise it won’t. Hope this helps. Yes, Steve, don’t condemn people to “death by Powerpoint”! 🙂 Thank you for your kind words. You are indeed an inspiration for all of us, and I hope you will continue to share your successes and failures of your online career. I am now working on my first course on Udemy and have high hopes for the future. I want to escape the 9 to 5, I want a freedom lifestyle where I can work where and whenever I want, and I want to work with what I am passionate about. That was really helpful. As a newbie, it’s really important to get the guidance from people who’ve already done what you want to do. And you are the one stop solution for that! The article gave me new ideas for preparing for my next course. I totally agree on the design aspect of the course “Don’t make all the videos look the same”. I love to test different visual aspects of the course and that really helps in engaging students. I’m pleased to administer virtual kicks up the backside, Dan, my pleasure. Best of luck with your Udemy course. You can do it! I loved Berlin when I went last year, lovely city. Thank you for the helpful post regarding Udemy. Firstly I wanted to thank you for introducing me to Udemy about 12 months ago on post where where you show your revenues from the previous quarter. Since then I have created two courses which are now on Udemy. Udemy is an amazing platform, and just recently one of my course has featured in the Udemy Instructor Innovation Awards where I won the award for ‘Incorporate Practice Activities into Lecture Video’ (basically where I involve students to do more practical activity inside each lesson). My current income from Udemy is roughly $500 per month since going live April this year, so once again, thank you for your direction and help/ advise on uploading courses onto Udemy. I have a quick question for you, I see you have over 10 courses on Udemy which range from Free access to paid courses ranging to £80 for the most expensive. Do you have your courses set up to be part of the Udemy special promotions offers, where Udemy normally offer discounts to your course for as little as £10? Or have you opted out of this and therefore you receive full payments or discounted revenues from your own coupon codes only? I would love to know what you do inside Udemy regarding this? Hey Jack, yeah, I’m loving Berlin. Really cool city, especially this time of year. I’m delighted you’ve found the content here useful and that Udemy’s been a success for you. Long may it continue, and, hopefully, those monthly totals will start increasing. Yes, I always have all my courses on all the discounts and special promotions. I go for everything because any sale on Udemy is a good sale. Udemy has the traffic so it makes sense to grow my brand there. I think the sweet spot for courses tends to be $99 for a 2-3 hour course. Most Udemy customers, as you know, tend to pay $10-29 for a course and that price for that content seems fair to me. I also think my free courses have helped me build my brand on the site as people have bought premium courses after having watched free courses. First I would like to say thank you for this great article, I myself have been planning to start teaching also, I see that Udemy is a great area to start learning and building a business. I know that there is a lot to learn but I do believe that taking action is a must for anyone who is starting out in any business venture. So Rob thanks again, have a great day. Hello Antonio, you’re absolutely right taking action is key! Thank you very much for your kind words and good luck with creating your first course. I’ve been following the great content you share for some time now and really appreciate all you contribute! I took your advice and created my first course on Udemy! But I didn’t do much advance marketing as you speak of in this article. I’ll know better next time. I think my challenge is not having a substantial and targeted mailing list. I’m working on building one but it appears to be a very slow process. I’m enrolled in your email class on Udemy and will finish it soon! I have other ideas for Udemy courses so I will press on with my plans! Thanks for the encouragement! Am thinking of getting a desktop mic like Blue Yeti but what do you use when standing up and talking into the camera? Guess you use 2 different microphones? Also, have you got any feedback on Screenflow for Mac? Hello Brad, great to hear from you! Everybody loves the Blue Yeti. I use the Sansom Meteor (good for travelling around with) however the Audio-Technica ATR2100 – Cardioid Dynamic USB/XLR Microphone is another favorite from the podcasting community. For standing up and talking to camera I use the Audio-Technica ATR3350IS Omni Lavalier Microphone for Smartphones (which is highly regarded) a little more expensive than other lapel mics. Yes, Screenflow for Mac is OK. It’s annoys be sometimes because it’s so buggy but it’s basically the best thing out there for the price. Camtasia is another option but it’s more expensive. I haven’t used it but apparently it’s not as good as Screenflow. Hope this helps. Let me know if you have any more questions about all of this. Are you allowed to have a Udemy-hosted course sold elsewhere, say on your own website or a service like Skilljar, Teachable, etc.? If so, I realize there would/might be slight content tweaks. And if allowed, I’m assuming pricing would need to be consistent across platforms, right? Hello Mark, you’re totally allowed to have a Udemy-hosted course sold anywhere. They don’t insist on any exclusivity.